Where can you view historical imagery in an intuitive, user-friendly map viewer? And explore historical imagery for nearly anywhere on Earth. Not only is Google a world leader in geocoded addressing, but you can leap to the past with its historical time slider. From satellite to aerial photography, Google Earth Pro puts the whole world in your hands. First, zoom to your area of interest. Click the time slider icon. Now, visit your neighborhood in the past. You’ll know which years are available based on the thumbnails. Recently, Esri has released their newest addition to the Living Atlas of the World. Basically, this collection of Earth curates essential geographic information that impacts people’s daily lives. For example, this includes items such as weather, traffic, elevation, demographics, oceans and urban systems. As part of their enormous collection of maps, Esri’s Wayback Living Atlas lets users browse historical imagery back in time. Still in the introductory phase, their collection of imagery is growing and evolving into a must-have platform for map historians. If you want to dig into USGS’s giant collection of about 7 million scanned historical image, take a trip to the USGS Earth Explorer. We have a step-by-step tutorial how to download imagery from the USGS Earth Explorer. Instead of satellite imagery, your search criteria would be “Aerial Imagery”. Some of my favorites being NAIP, DOQ and the mosaics. For rapid viewing of Sentinel-2 and Landsat imagery, the USGS Land Look spans back to 1999. First, load your images by filtering the days, years, cloud cover and sensors. Next, you can play a video displaying each scene in your time span. Finally, if you want to export your scenes as PNG, GeoTIFF or JPG, you can select the “export” tool. Overall, USGS Land Look is ideal for searching historical imagery which are part of the Sentinel-2 and Landsat archive. 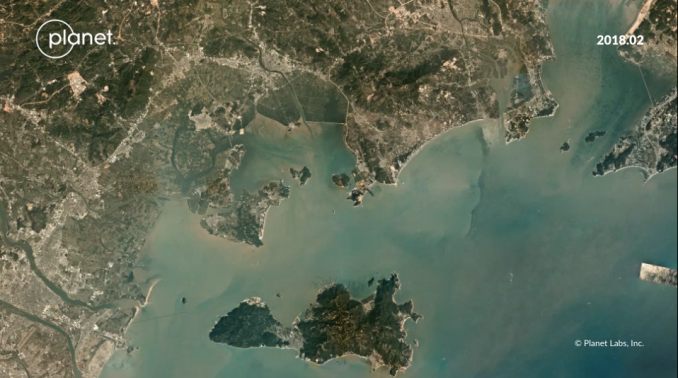 NASA’s Worldview has 600 global, full-resolution satellite imagery layers. Albeit, they’re coarser than the others in this list. But essentially, they show the entire Earth as it looks “right now”. Actually, it’s updated within three hours of observation. So you’re probably asking: this isn’t historical imagery, is it? Instead of using the current date (which is the default), you can step back in time by adjusting the time slider. Unlike the cloudless imagery were accustomed to, this is the true view of our planet. They are a team of ex-NASA scientists who built their business embracing low cost, lightweight, micro satellites in space. They are the largest collector of Earth imagery with a constellation of 175+ satellites in orbit at this time. Planet has a “freemium” service which dates back to 2009 giving you historical context on your areas of interest. Planet’s fleet of satellites is ideal for monitoring anything on Earth. For example, Planet Stories allows users to use space imagery and tell their own story anywhere. When you want historical context for an area of interest, there are several options to help you get started. Google Earth is a mobile and desktop application with an enormous collection of historical imagery for free. Esri’s Wayback Living Atlas provides an online platform. It’s free and it’s growing for historical images. Lastly, it’s becoming more ubiquitous to the average user. Finally, USGS, NASA and Planet’s constellation of satellites provide an alternative means to view the history of Earth.